I decided to write this post in English, just to see what happens. Maybe more people will read it, maybe less. And maybe I’ll write more in English in the future. I don’t know, it’ll kind of be up to the statistics to decide. And now to the point. Some time ago we had this rare chance to see both a total eclipse of the moon and a supermoon at the same time. My experience told me that probably the weather would not cooperate, but as I checked the forecasts in the days before, the chances of clear skies just got better and better. So I thought «why not just pretend it’s going to happen and prepare for it anyway». And so I did. I started to think about possible locations. I wanted a somewhat elevated location with a view facing west, and with a foreground. I wanted to make a landscape image, and not just a close-up of the moon itself. At first I thought about making one of these composite images with the whole time span of the eclipse, but I figured I didn’t have enough experience in this kind of photography. So it would be a straight landscape under the red moon. Obviously I had to check out my candidates for locations and also the position of the moon during the various stages of the eclipse. I went to The Photographer’s Ephemeris to look at a few alternatives and ended up with this place. It is at Kjeller, just outside Oslo, and about 25 minutes drive from my home. The field was sloping down with a view of city lights. Kjeller is mainly known for two things. First of all this is the location of Norway’s oldest and one of the world’s oldest airfields, Kjeller Airport, in continuous operation since 1912. Kjeller is also home to one of two nuclear reactors in Norway, the Kjeller Reactor. Anyway, back to the eclipse. The partial phase was due to start at 03:07, and the total phase at 04:11. Since it was a Monday and working day I could not be up all night to see everything. I set my alarm at 03:00, aiming to see the whole total phase. My son wanted to come along too, and we packed our cameras in the car and as we went off we saw the shadow of the Earth had started to cover the moon. We got to the shooting location around 04:00 and had almost enough time to set up our gear before the eclipse was total. It was really spooky to see how the moon turned red, we had never seen it before. Since we arrived quite late we discovered that it was very difficult to find perfect focus on the moon in the dark. Autofocus did not work, and magnifying Live View gave too much noise for good manual focus. Also focusing on distant lights was not as accurate as I had read it would be. In the end I just did the best I could and stuck with it. The moon is not tack sharp, and so be it. Lesson learned for the next time: Be early enough to focus on a bright moon! The picture I had in mind was a landscape shot with the field in the foreground, then the closest buildings and a sea of city lights streching out towards the horizon. 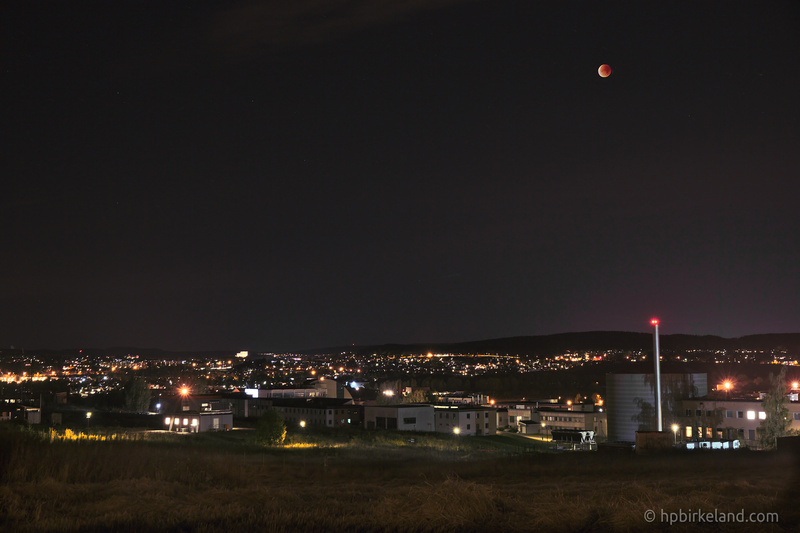 I wanted the red moon directly above the nuclear reactor, and a few stars and clouds would be nice. When we arrived, the moon was not yet in the correct position, so I spent some time finding the best possible focus and exposure settings, and I also tried out different angles. There was also time to put on my 70-300 mm lens and take the closeup you can see above. Since the moon is constantly moving, I needed a fairly fast shutter speed. which in turn requires a high ISO value and a wide aperture. The widest possible aperture for my lens, f/3.5, would require a too short focal length, leaving the moon too small. Therefore I chose a focal length of 28 mm. This could give an aperture of 4.5, but instead I for some reason ended up with 5.6. For a 2 second exposure I then needed an ISO of 1600. At this ISO my Canon 550D has a good bit of noise. In order to keep the landscape portion of the final image as noise free as possible I decided to take and extra exposure of 30 seconds at ISO 100 and then blend the two. I could then use quite heavy noise reduction on the sky and moon. Since the moon was slightly out of focus anyway I would not loose too much detail. After blending the two exposures I thought the moon was still a bit too small, so I placed it on a separate layer in Gimp and enlarged it by 20%. I was a supermoon after all, wasn’t it? Enjoy the result below, and see the complete list of hardware and software used below the image. Blood moon above the Kjeller Nuclear Reactor.